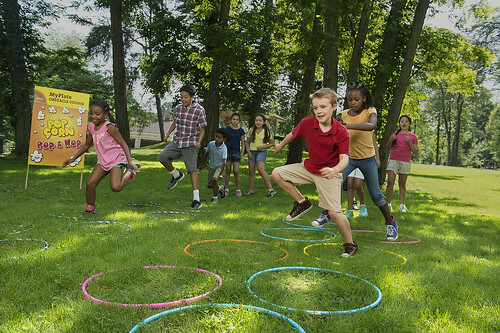 Creative themes and fun games help summer meal sites offer nutrition education and active games. With summer just around the corner, it’s the perfect time for communities and parents to start thinking about activities for kids when school is out. With deliciously juicy local fruits and veggies coming into season and, in many areas, warmer weather that invites summer play, it may seem logical that keeping kids healthy would be easier during summer months. However, without the structure of school and afterschool sports, those lazy summer days can sometimes lead to constant snacking and endless hours playing video games and watching TV. For some children, the summer months can mean food insecurity because they no longer have access to regular school meals. That’s where summer meal programs can help, not only by offering free healthy meals, but also by providing opportunities for nutrition education and physical activity. New materials developed under USDA’s Team Nutrition initiative include a Take a Healthy Summer Break infographic and This Summer, Eat Smart to Play Hard parent’s guide to provide suggestions for practical ways to keep the whole family healthy during the summer. These are a great resource for schools and community groups to distribute towards the end of the school year. 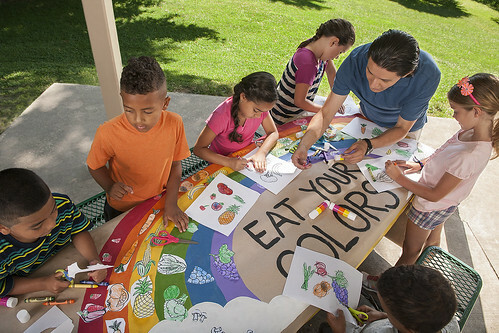 Help kids take a healthy summer break with nutrition education at summer meal sites. Team Nutrition also offers an additional Summer Food, Summer Moves kit for summer meal site operators that includes fun activities with positive nutrition messages that can be used in a variety of summer meal settings, from parks to libraries to schools. The kit also includes posters, family handouts, and a placemat activity sheet. Enrichment activities, such as providing nutrition education, games and sports, when paired with a healthy meal at summer meal sites, helps children get the nutrition they need. It can also help kids learn healthy habits they’ll use for life! All of Team Nutrition’s new summer materials are available in both English and Spanish. 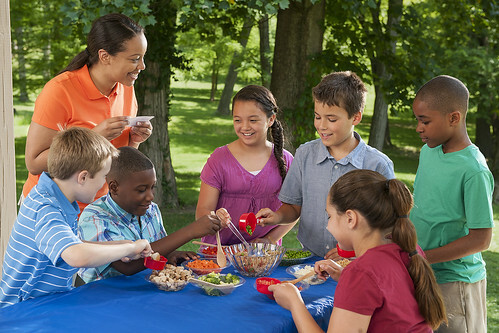 Learn more about these free summer resources at: http://www.fns.usda.gov/tn/summer-food-summer-moves. To learn more about becoming a summer meal site visit: http://www.fns.usda.gov/sfsp/summer-food-service-program-sfsp. Summer Food, Summer Moves includes over 30 fun games and educational activities for summer meal sites.